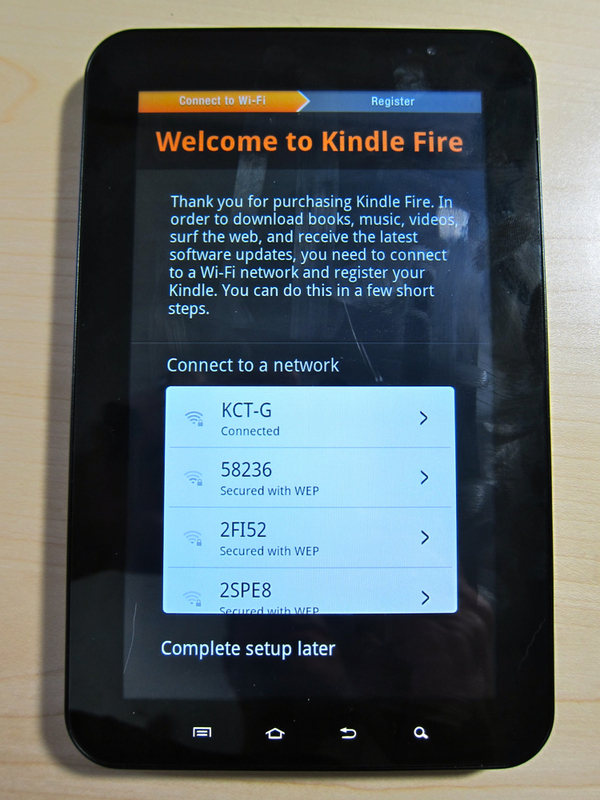 After spending nearly a week with the Amazon(s AMZN) Kindle Fire I purchased, I’ve been hard-pressed to make a decision: Do I keep it or do I return it? My rationale has nothing to do with the device itself. Yes, it has shortcomings, but mostly, the Fire meets my expectations for $200. However, I purchased a 7-inch Samsung Galaxy Tab last year, and there’s just way too much overlap between the two devices. I decided to change that, by adding some of the Amazon Kindle Fire software and user experience to my Tab. Thanks to both the thriving enthusiast / developer community at XDA-Developers and Android(s GOOG) allowing you to jack around the filesystems, every bit of the Fire’s software can be extracted or dumped. That means most of the apps that make the Fire work can be installed on other Android devices. Is that a Fire on my Tab? It turns out the Kindle Fire interface — the bookshelves that act as a home screen and launch point for all activities — is basically a launcher application, and there are a number of third-party launcher apps available that allow you to “skin” an Android phone or tablet. I figured Amazon’s launcher app for the Fire is no different, and I was generally right. I have it installed on my Galaxy Tab, so when I hit the Home button on my slate, I can either go to the standard Samsung home screen or the Amazon Kindle Fire interface.The new interface allows for reading both e-books and magazines, which is important: One of the magazines I subscribe to on the Fire can only be read on a Fire at the moment because the content isn’t available on the standard Kindle app for Android devices. That’s only part of the puzzle, however. In the list of extracted software, I also found an installable application that adds Amazon Video software. With this app, I can now rent and stream movies or TV shows directly from Amazon on my Galaxy Tab. At first, I wasn’t able to take advantage of the free Amazon Prime streaming feature; I couldn’t find a way to add my Amazon account to the Tab. But I found a simple workaround. I attempted to rent a movie and the software — realizing I wasn’t logged in to Amazon — prompted me for my account credentials. I then cancelled the movie rental, hit up the Prime content and was able to start streaming videos for free. The Kindle Fire also has a revamped Amazon Store app, which I like it better than the standard Amazon Mobile app available in the Android Market. It’s not surprising that it’s better on the Fire; why wouldn’t Amazon optimize the retail experience on the device that it sells? This app, too, is in the software extract and installs just like any other .apk, which is the file extension for all Android apps. I don’t have Amazon’s Silk Browser working on the Galaxy Tab, but to be honest, that’s a non-issue for me. It’s not because I have security or privacy concerns about Silk. I’ve long preferred the speedy and feature-packed Dolphin HD Browser for my Android devices. So far, the whole setup is very fussy and the Kindle Fire user interface crashes quite a bit. I’m also dealing with formatting issues: Both the fonts and icon images are too large for some reason, even though both the Fire and Galaxy Tab have the same 1024×600 screen resolution and density. I’m sure if I keep hacking around, I’ll be able to address that. The force closing of the interface isn’t something I’m likely to stabilize though. There’s clearly some integration points between the Fire’s software and Amazon’s cloud services I haven’t connected yet, and I may not bother, depending on how much free time I have to keep tinkering. Instead of dealing with the Kindle Fire interface crashes on my Galaxy Tab, I’m going to stick with my standard Samsung launcher. But I’m going to keep the Amazon Video and Amazon Store apps installed. I already have the standard Amazon MP3 app — with both the MP3 store and Cloud Player feature — because its available for all Android devices. And of course, any Android device can also read Kindle books through Amazon’s freely available software. Essentially, I have all of the Kindle Fire functionality minus the interface and the ability to read digital magazines through Amazon. Even here, there are options such as Zinio. To her, the Fire does everything she needs for a low price. She says she’ll primary use it for reading books, but likes the option to play music or watch videos from time to time; either through Netflix(s nflx) or Amazon. She uses an iPhone 4S(s aapl) for her apps and email, so these features in the Fire are secondary to her. In short, she’s the perfect target audience for the Fire. I would be, too, if I didn’t have a Galaxy Tab. But isn’t this Amazon’s software you’re using? I’d be remiss if I didn’t bring up the fact that Amazon developed its software for the Kindle Fire and not for other Android tablets. So using the apps and interface on anything but a Kindle Fire could be construed as taking money out of Amazon’s pocket. Yet, the very opposite is true; at least in terms of content. By adding the Fire-specific applications on my Galaxy Tab, I’ll surely buy even more digital media from Amazon in the form of books, movies, and music. The only revenue Amazon doesn’ t get from me is the cost of the Kindle Fire hardware. And the company is either making very little profit on that, or actually losing money, depending on who you ask. I’ll call this one a win-win for both me and Amazon; especially since my wife is keeping the Fire. That’s cool but were is the how too? @hoosier40 I wouldn’t be surprised to see more hacking to make that a reality. http://t.co/7DBkWlux I’m a big fan of Kindle Touch so far. This post must be like catnip to Jeff Bezos. It’ll be interesting to see what he does with it! Is there any way you could provide a link to the Amazon Video .apk? Can you post a link to the Amazon Store .apk? Is there a licensing issue using these apps on non-Amazon hardware? I don’t haven’t looked into it at all, but I assume that Amazon has a reason that they don’t yet offer things like the lending library on the app (non-Kindle hardware ) versions. It just seems like buying a Kindle, downloading software from it to load it on a different manufacturers device and returning the Kindle is wrong. David, that’s a very valid question and the short answer is: yes. 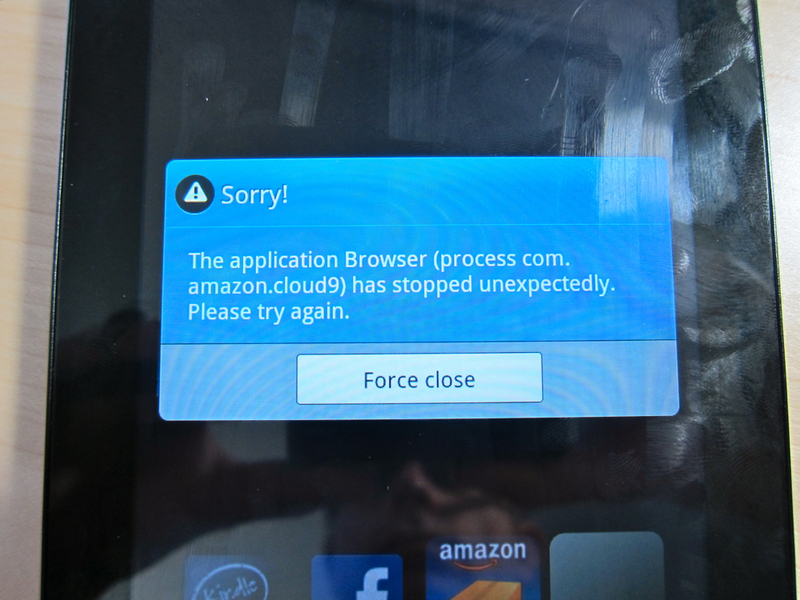 When Amazon chose to go with an open-styled platform in Android, however, it had to know that folks do this to nearly every Android device on the market today. I’ve installed custom ROMs on my Samsung Galaxy Tab and Nexus One phones well over 100 times to gain new features or better performance. I’m not saying it’s a justified action, but it *is* the reality of the Android space. I’m also not one to condone the use of software that wasn’t bought. In this case, what is Amazon losing, except the sale of the hardware, which some have estimated to cost more than $199. I’ll actually buy MORE content than before since I can now use Amazon Video and buy Magazines on my tablet. And to clarify: I didn’t download the software from the device I bought. That was done by forum members at XDA-Developers, who then posted it. I’m also not returning the Kindle I bought as my wife is keeping it. You can make a case its less intergrated than Sense then, since you can’t really decouple Sense without flashing a new ROM and you can not install Sense to a different phone. Completely agree; Sense isn’t just a launcher app as it’s integrated deeper. Considering that Amazon looses money on each of the Kindle Fire’s sold to you, they’d actually be a bit happy (though when you buy a Fire, you’re locked into their island of content). Still, I think it’s only a matter of time until those updated apps are available on the Android Market. Agreed on all counts Jeff, but you’re not locked in with Kindle books, or Amazon MP3s. Currently you are for video and magazines. And those are easily replicated through other stores. Have you had any luck getting the custom Kindle eBook app from the Fire to run on the Galaxy Tab? It froze on my NOOK Tablet and Nexus One. I think it’s a much more resource-intensive app than the typical Kindle app, which probably helps explain why page turns are sluggish. But it does include access to the Kindle Owners Lending Library and Personal Documents features, which you don’t get from the existing Kindle app for Android. I initially had similar problems, yes: it just went to a dark screen and the app stopped responding. But then after some more fiddling with different Kindle app versions, I had it going. Of course, I’ve been hacking away and resetting my device a few times during the process, so I don’t have it nailed down in terms of exact steps to get it working. Cool. I’d love to get the Personal Docs and other features working on my other devices. Or I suppose I could wait for Amazon to roll out an updated Kindle app… I’ve heard it’s in the works.